NB: Guiding Rates are quoted in NZ Dollars (NZD) and are subject to change. They include Goods and Service Tax (GST) of 15%. My guiding rates cover a full day of guided fishing … (NB: I do not guide half days). Typically a day’s fishing involves angler pick up between 7.00 – 8.30 am and fishing until 5.30 – 7.30pm. 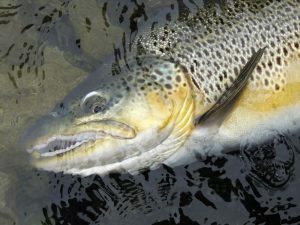 Times can be varied on request to suit each angler’s preferences or commitments. This is something that is usually sorted on the day. If the fishing is ‘firing’, I’m happy to stay on late so my anglers can maximise their opportunities. Pickup and delivery from accommodation, courtesy road transport during fishing day and lunch. NB. Fishing Licences and boat or helicopter charters are additional costs. Fees for boat or helicopter charter will be advised to the angler before any charter is undertaken. Fees for boat or helicopter charter are to be paid directly to the charter operator, typically either by cash or credit card. Some of these locations we visit are designated back country fisheries and also require anglers to ensure they have the appropriate Backcountry Licence Endorsement. Please ensure you read my Conditions of Bookings and Payments below. See WINTER RATE below for fishing between May 1 – September 30. 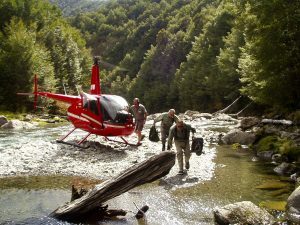 Make the most of chartering a helicopter to access a remote river, by camping out overnight to maximise fishing time. 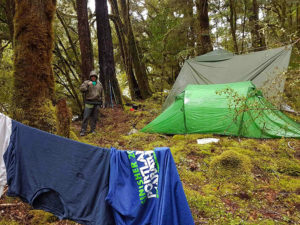 Includes guide fee, helicopter charter (ex- Nelson), a campout fee, campout equipment and food. Fishing Licences are an additional cost. Some of these locations are designated back country fisheries and also require anglers to ensure they have the appropriate Backcountry Licence Endorsement. … These trips are arranged on request for 1 or 2 anglers. They do not involve hiking huge distances (1-2 hours hike), but do require the carrying of a modestly weighted backpack with sleeping gear and personal clothing. Quotes will include guide fees, any water taxi charter, a campout fee, campout equipment and food. Fishing Licences are an additional cost. Some of these locations are designated back country fisheries and also require anglers to ensure they have the appropriate Backcountry Licence Endorsement. Includes pickup and delivery from accommodation, courtesy road transport during fishing day and lunch. A deposit is required to fully confirm a booking. All prices will be quoted in New Zealand Dollars (NZD) and will include statutory Goods and Service Tax (GST), currently set by the Government at 15%. A deposit invoice will be issued and can be paid either by Visa or Mastercard, bank cheque or by direct credit to our bank account. Details will be included on the invoice. Fishing dates specified in the deposit invoice will be held for 14 days only, from the invoice date pending payment, before a booking is finally confirmed. Deposit for 2 day bookings will be 50% of the estimated total guiding fee. (NB. I do not take forward bookings for single guide days more than 5 days in advance of a requested date). Deposit for bookings of 3 days or longer will be 33% of the estimated total guiding fee. Deposits exclude fishing licences, accommodation, helicopter or boat charters or any other additional expenses that anglers may incur when they are not specified in the guiding rate above. Full payment, including any additional fees and expenses incurred by the angler, will be charged at the completion of the trip. Preferred methods of payment are: Cash, Visa, Mastercard, internet banking, bank transfer, NZD bank cheque or cash. Please note: There is an additional 3% surcharge on all Credit Card transactions. Foreign personal cheques are not accepted. Travel insurance is recommended as essential. For cancellations more than 60 days prior to the reservation date, the deposit will be refunded, minus a booking charge of NZD$400.00. Thereafter the entire deposit is forfeited unless the client finds a replacement angler. Please understand that late cancellations are a significant burden for any small business. 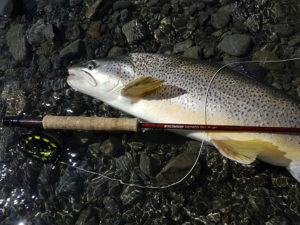 Tony Entwistle’s Fly Fishing cannot be responsible for the safe-keeping of customers’ property. Upon commencing a booking, you agree to release us from all liability for loss or damage to that property. You also agree to release from all liability and to indemnify Rod and Gun Shop Ltd (t/a Tony Entwistle’s Fly Fishing) and any staff, against any liability we incur to anyone else resulting from the failure by you or any other member of your group to follow our instructions.